And Later,The Stubborn Teenage Girl Abandons Her Baby After Delivery,Compels Her Government To Do This Thing! Any girl child who gives birth and later abandons it must have been abandoned and rejected by her own mother too. That is a fact! And any mother who refuses to accept her daughter's pregnancy must have been grieved by the foolishness of her daughter as well,and that is another fact! Mother's support is everything for a helpless child,a pillar on which she could rest. 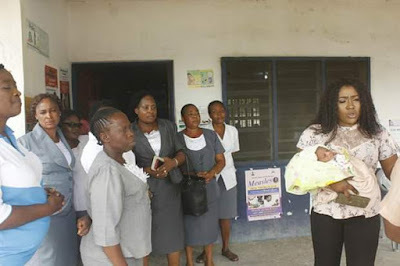 A teenager,Mary Bassey as she was called abandons her bouncing baby boy after he was delivered right at the health center where she delivered her baby boy. Mary said she doesn't want the baby and that if the government does not take the baby away from her,she would do away with him. We then asked ''Did government ask you Mary to produce a child for her?'' Thinking she was joking,the nurses at the health center tried to make her eat in order to give her some post natal treatment but the young mother refused to accept. She insists that if the baby was not taken away from her,she would not cooperate with any body and may do away with the baby. After sometime however,Mary was no where to be found. She ran away,and that was it till today! One may say that Mary was very stupid for abandoning her baby after giving birth to him. One might also say it is needless and unreasonable abandoning a child after nine months of carrying him! But there is wisdom in the heart of the young mother,who said her name was Mary. One,Mary knows that she could not take care of the baby. She also knows that government could take the responsibility of any baby that could not be taken care of by the mother. Mary was also convinced that it is better to keep a child than to get rid of him through abortion. Finally,Mary knows too well,there would be no place in the home of her parent for her fatherless baby! Do not criticize Mary so much for getting pregnant but largely blame her for giving her body to one stupid and good for nothing boy who later got her pregnant. Yes,blame Mary for not heeding to the warning and parental advice which must have made her run away from home,not willing to be seen by anyone at home with the child. But mothers please forgive your daughters after going astray. They are still but like a little child! Abandoning your girl because she went too far with a boy so stupid not to take his responsibility would not or ever make you gain anything. It is a loss upon loss that this would bring you. You would lose your daughter and the bond,and your grandchild as well all because of her MISTAKES. If Mary's mother had swallowed the mistakes of Mary and welcomed her with her baby,Mary wouldn't have run away,she wouldn't have abandoned her baby who would soon be claimed by someone else! Mothers please,let the steam off thy heart after the deed has been done to avoid further pains and loss! And you girls! When would you grow up to have some sense? Why would you get attached with a man who has not made himself? A man who is still taking food from his mother? A man you know so much who can not take any responsibility of himself not to take your own responsibilities? No girl who has become pregnant out of wedlock has ever smiled at doing so and unless the moral principle changes,you can never get away from the bitter consequences!! !